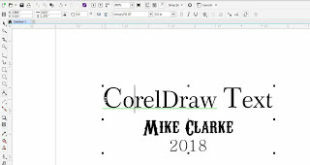 Working with CorelDraw’s Object Manager and How It Controls Your Engraver. The object manager can be found in the “Tools” menu. See Figure 1. Note: for this example, make sure you have no objects on your page – so start a new file. After clicking on this command the object manger will “dock” to the right side of your screen. See Figure 2. For those of us who have used CorelDraw for several versions, we know that before we had the Object Manger we had the Layer Manager. 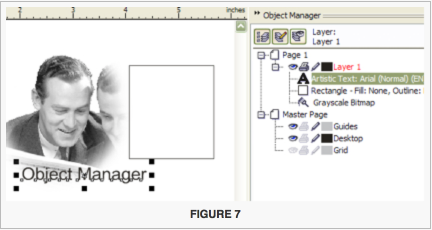 As was the nature of the layer manager the Object Manager is the controller of how we organize “layers” in CorelDraw. To me the Object Manger is like an index of a book or database that lists all the items that are in our page(s) that we have created in our open file. With the Object Manager we can easily find a certain item (in this case an object) by looking for the object’s attributes that are listed in the Object Manager. In my opinion you do not know CorelDraw unless you know how to use the Object Manager. Typically I judge how much someone knows about CorelDraw by whether or not they use the Object Manger properly. With the Object Manager open let’s review a couple of the more notable items that need to be understood about in it. 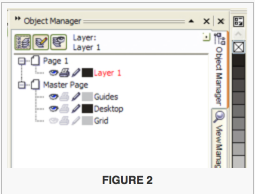 If you look at Figure 2 you will see that we have 4 “stock” layers that come up when we open the Object Manager. Let’s review these before we continue. The Master Page is composed of the 3 basic master layers of an active drawing: Guides (all your guidelines), Desktop (”The layer in a drawing where you can experiment and create objects for future use. 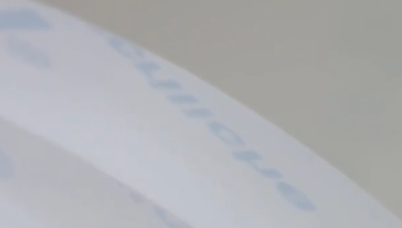 This layer is outside the borders of the drawing page. You can drag objects from the desktop layer to the drawing page when you decide to use them”), and Grid (all your grid lines). In the Master Page you can also create Master Layers. 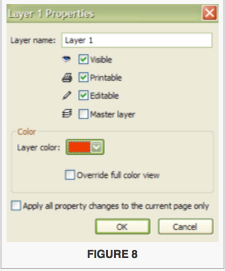 Master layers are layers whose contents appear on each page of a multiple page document. You cannot delete any of the 3 stock master layers. Also created is a fourth called “Layer 1”. You can change the name of layer one. This layer houses any items that we create in CorelDraw. We can create more layers if we want. We will discuss this later on. You will notice that each of these layers has 3 icons to the left of the layer. These icons are as follows. clicking on this icon allows us to see or not see what ever is in that layer. For example you will notice that the eye icon on the grid layer is turned off. Click on it and a grid pattern will appear. Click on it again to turn it off. clicking on this tool allows us to turn on or off the ability to select or modify any object that is in this layer. 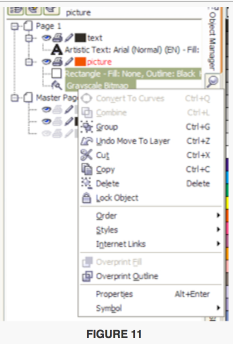 When the pencil is gray we can not select the objects in the layer. When the pencil is black you can select any object in the drawing. allows us to turn on or off the ability to print a layer. (Red Box) – Displays or hides detailed information about objects on different layers of your drawing, such as fill, outline, and shape. This button is active when it appears pressed. (Blue box) – Allows or Disallows editing across all the layers in your drawing. 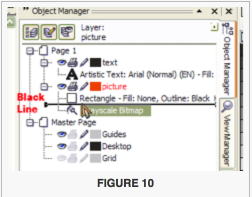 (Green Box) – Switches to Layer Manager View, displaying lists of layers but no objects or sublevels. The two icons at the bottom of the Object Manager allow you to create new layers or master layers. 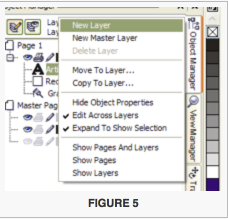 The “add new layer” is the red box and the “add new master layer” is the blue box in figure 4. You may also access a number of these commands by clicking on the black arrow that appears to the far top right of the Object Manager. This will display a pull down menu as per Figure 5. Create a new layer. One of the first things that I like to do is to go in and rename “Layer 2” to a more appropriate name. To do this first right click on the name “layer 1”. A pull down menu will appear as per figure 6. Select “rename”. Type in a new name that you want to identify this layer with. For example let’s call it “text”. You will notice as we draw each image a small shape along with an explanation is listed in the Object Manager under the “Layer 1” layer. Also the first image that is drawn is on the bottom with each succeeding image being created on top of the previous image. We now have created an “order” in our drawing. 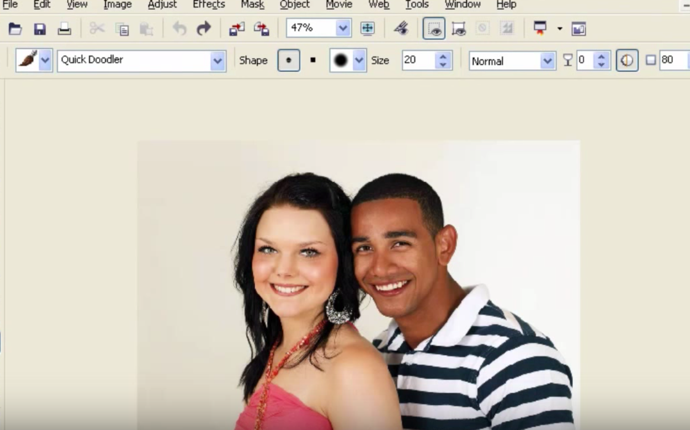 If we press the “tab” key with nothing selected you will notice that every time you press the tab key the next image in the drawing becomes selected. This selection order, which goes from top to bottom, is the order of how the objects are arranged in CorelDraw. The “shift tab” order goes from bottom to top or the opposite of the tab order. Notice that each image that is selected on your page is highlighted in the Object Manager. You can also select one of the objects by selecting it in the Object Manager (click on the Ellipse – you will notice that it becomes selected on the page). If you hold down the “shift key you can select more than one object in a row. The control key allows us to select individual objects. Can you think of times where you had a complicated logo and selecting an object or group of objects was hard because of other overlying objects? Using the Object Manager makes this a lot easier. There are a number of commands that can be issued to help us “customize” our layers in the Object Manager. These commands are found in the properties of the layer. To access these commands right click on a layer and select “properties”. You will be presented with a dialogue box as per Figure 8.
allows us to change the name of the layer. 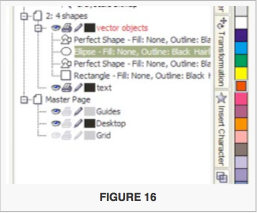 The blue box in Figure 8.
allows the layer to be moved to the master layer and be viewed on all pages in CorelDraw. allows us to change the colour of the “layer indicator” box to show the colour we chose – Default colour is black. 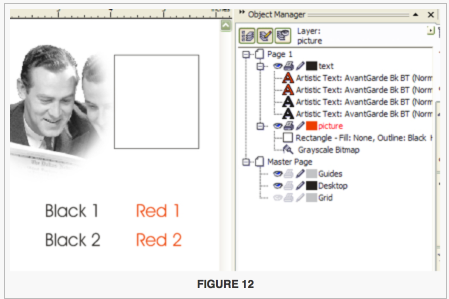 Red Box in Figure 9.
allows all objects in that layer to be displayed in the colour that is selected in the layer colour. Note: if you select this you will see all objects drawn in this layer display in the selected colour. However they will still retain the attributes of the original colour that you drew them in. So your line may display red but if you created it in black it will still be black. 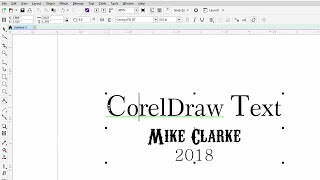 To test this you can select the line and look at the attributes of that line at the bottom right corner of the CorelDraw page. Basically it means that the changes you make in this box are only to be view on the current page. Within the Object Manager we can perform a number of operations on our images. All of these operations can also be done on the desktop but sometimes they can be done easier in the Object Manager. One of the things that you can do in the Object Manager is move your objects up or down in their selection order. To do this we need to click on the image and “drag it up or down”. 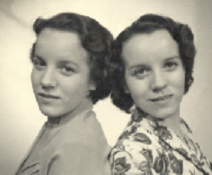 Let’s move up the photo (bitmap) so that it is above the rectangle. Click on the bitmap in the Object Manager and drag it up till a heavy black line appears. When you see this you can let go of the mouse. 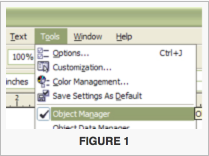 See Figure 10.
using these commands in the Object Manager is as simple as selecting the objects you want to work with and than right clicking on the selected objects and than to chose the command that you want. See Figure 11. One of my favorite features of the Object Manager is that I can easily select an individual object in a grouped set of objects. Just click on the object in the Object Manager. You can also do this by holding down the “ctrl” key and clicking on an object on the page but when it comes to tight placement the Object Manager always wins for me. Sometimes for additional control of an image you may want to create layers so that you can group certain objects. For example maybe you want to place all your text on one layer so that you can turn it on or off. If you remember my original article on digitizing around a scanned image, I placed the scanned image on its own layer so that I could turn it off or on quickly. By turning off the logo I was able to see clearly how my digitizing was going. 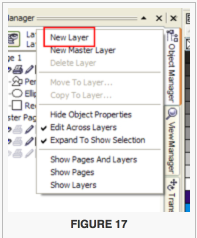 To create additional layers all we need to do is click on the “add layers” icon at the bottom of the Object Manager window or click on the black arrow and chose “new layer”. See Figure 5. You can also move layers around by clicking on a layer and dragging it to a new location in the Object Manager just as we did with the individual objects. 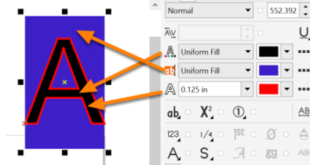 Note: If you want to enter text into a layer you need to make sure that the layer is active. To do this you need to click on the layer name in the Object Manager. The layer is active when the text for the layer tag is red or there is a blue box around it. If you have not created a second layer yet create a new layer by clicking on the “add new layer” icon at the bottom of the Object Manager. 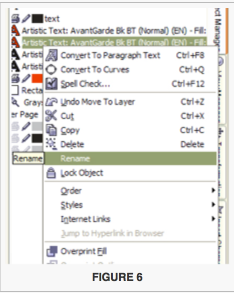 Next, right click on the “layer 2” text and select “rename”. Than, type in the word “text”. Make sure the “text” layer is active. Now, type in the words “black 1”, “black 2”, “red 1” and “red 2”. Note: I want each word to be its own object so to do this you need to click on the page with the text tool every time you are going to type in a new word. Now select the two words that say red and fill them with red. 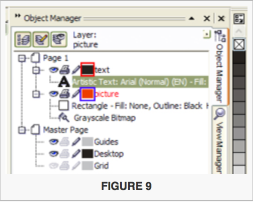 Your Object Manager will look like Figure 12. 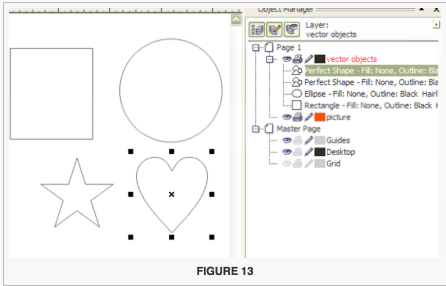 We have a document that is well suited to be used to explain how the object manager can control the order of engraving. 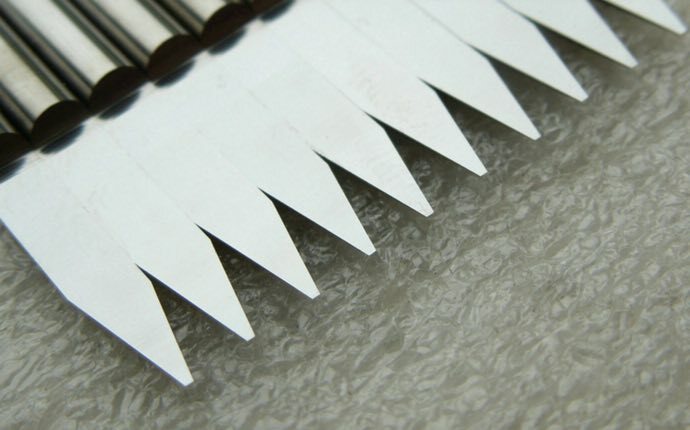 Raster information causes the laser machine to travel back and forth in a back and forth or linear motion. The machine processes the information and works from the top down. It will process the information until it reaches the bottom of the page. Thus, for raster information I found that for my machine the only way I could control the order of engraving was to use different colours. The machine would process the black information first than the red second. It didn’t matter where the object was in the Object Manager. The machine just works from the top down. 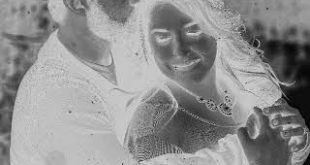 Thus controlling engraving with raster images is limited to colours and not the order of the object in the Object Manager. If we look at Figure 12 you will see that I have text that is black and text that is red. 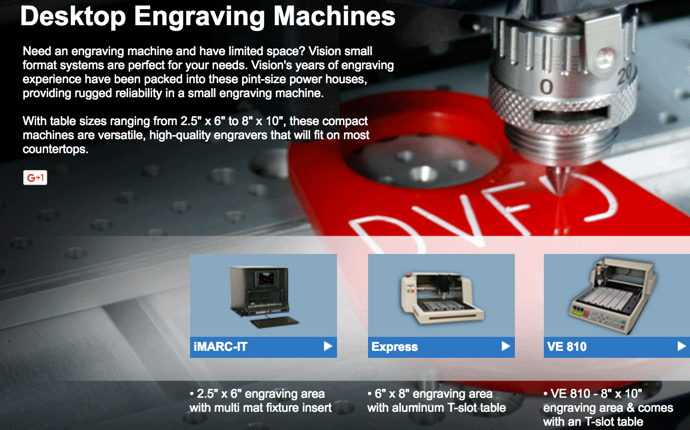 I can tell the laser to engrave the black text first and than to laser engrave the red text second. 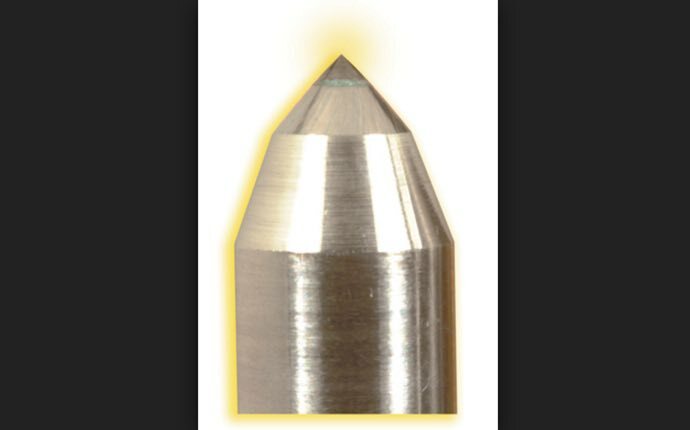 Working with vector images (typically cut out processes) with the laser is just like a rotary engraving machine. The nice thing about working with the laser is that we do not have to contend with file importing we just go file print and off it goes. What I found with the laser was it functioned just like the mechanical engraver following the order of the objects as they appeared in the Object Manager. 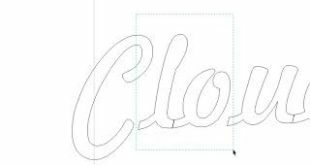 The one difference was that the laser followed the shift tab order in CorelDraw (which works from the bottom up or the first object to be drawn). Again if you wanted to change the order all you need to do is to move an object up or down in the Object Manager by selecting the object and dragging it into place with the mouse. 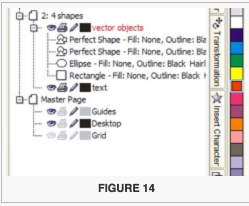 If we look at Figure 13 you will notice that we have 4 vector objects in the “vector” layer. 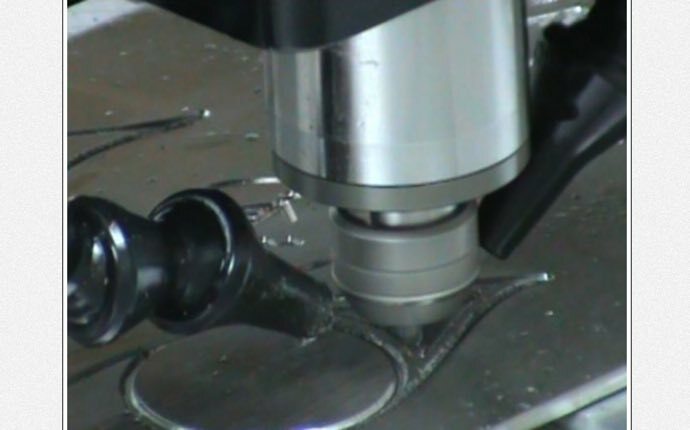 For our machine the engraver will process the objects in from the bottom up. The rectangle will be first and the ellipse second and so on. Within my workspace I have drawn 4 objects – a Rectangle, an Ellipse, a heart and a Star. Each one shows up in the object manager. The Rectangle is first, while the Ellipse is second and the Star (Perfect Shape) third and the heart fourth – see figure 14. If you want to change the order of the engraving than you can “promote” one of the other objects down in the list so that it now goes before the ones above it. 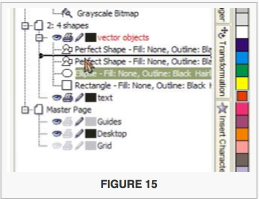 To move an object all you need to do is to click on the object in the object manager and while holding down the left mouse button drag the object to its new location – see figure 15. Note; you will notice the black bar line that indicates where the object will be placed. Figure 16 shows us the ellipse object is now moved below the heart and above the star. It will engrave before the heart but after the star. Once the second layer has been created you can drag any of the objects into the layer. Note: a quick way of finding out what items will engrave first is to hold down the shift key and press the “TAB” key. This will cycle through the objects on your workspace. It is very important that if your drawing is going to be complicated that you break it down into different layers. If you do this than it makes it a lot easier when you need to select certain items that need to be engraved. One of the things that can be frustrating when you are cutting objects out on your laser machine is that the order of your engraving tends to move in a direction that seems beyond your control. Well luckily there is a way to control the way your laser engraver moves. The way we control the laser is the way that the objects are ordered (drawn) in CorelDraw. For example the first object drawn is the first object to be engraved. The second object drawn is the second object to be drawn. The third drawn is the third engraved and the process repeats itself until we have engraved all the objects in our job. The question becomes how can we see which object is going to be engraved. If we have a lot of images on the screen we may not remember the order in which everything was engraved. Secondly, what about if we want to change the order of the objects that we have created in our drawing? Both of these concerns can be taken care of by using the object manager in CorelDraw.